One of the superb view of The Bonin Islands of The World Natural Heritage, Minamijima Island is a special terrain called "submerged karst topography" which is unusual worldwide, and the entire island is designated as a Natural Monument of Japan. This beautiful island that is also designated as a special protected area of Ogasawara National Park. Let's have a look at the beautiful Minamijima Island short movie. 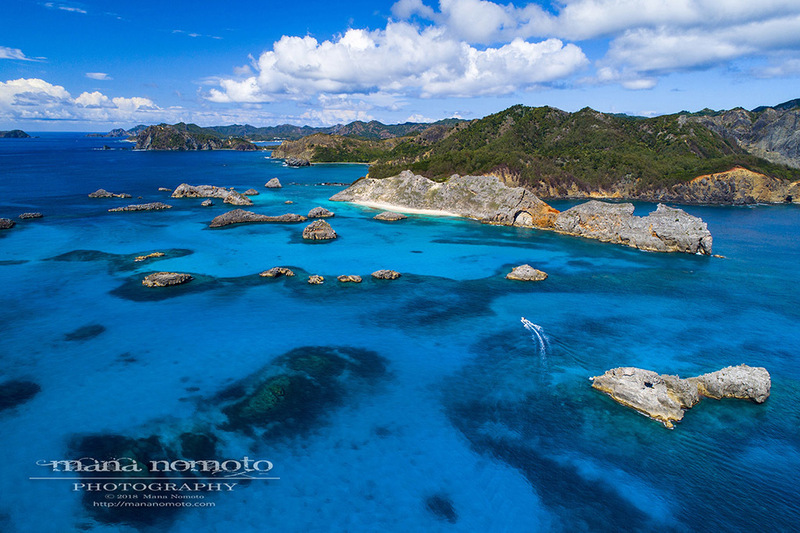 There are not many places where you can fly Drone freely in Ogasawara Islands. Most of places, you need to apply for flight permission to the Relevant Organs in Ogasawara Islands. ※ I have been obtained flights permission by The Ministry of Land, Infrastructure, Transport and Tourism. There’s a wreck of the “Hinko-maru” which was torpedoed and sunk in the shallow waters just off the Sakakura beach during the Pacific War. You can easily explore the shipwreck and see many fishes by snorkeling. ※ There are not many places where you can fly Drone freely in Ogasawara Islands. Most of places, you need to apply for flight permission to the Relevant Organs in Ogasawara Islands. Typhoon Sanvu which brought record breaking heavy rain once in 50 years to the Island. It’s moving very slow and seems like typhoon is enjoying sightseeing Ogasawara Islands. Everyone is thinking that typhoon is moving toward to the North. However it came back again! It kind of calm now, because of the island is in the eye of the typhoon. It’s a very rare cace to be in the eye of the same typhoon twice. I’ll stuck inside the house until tomorrow afternoon again. I should organize photos and video footages in the hard disc when such a day. Please see the beautiful short movie of the Jinny beach today.